At La Plata Dental, we know many patients experience dental phobia and anxiety while visiting a dentist’s office, and we do our utmost to ensure patients’ comfort every time they visit us. Even with a friendly, attentive dentistry team and a gentle, skilled dentist, we know that not every patient looks forward to visiting the dentist, and the anxiety or phobia they experience may be preventing them from getting the dental care they need. If you are one of these patients who needs a little extra help remaining stress and pain free during their appointments, we offer sedation dentistry services. Contact our team to find out more or schedule an appointment in our La Plata dentistry practice. Sedation is a great option for patients with dental phobia and anxiety and those with sensitive teeth, gums, or gag reflexes. Patients whose cognitive abilities make it difficult to understand their situation may also want to consider the use of sedation dentistry to ensure safe treatment. Kids may need dental sedation during more advanced treatments to keep them safe and avoid crating negative associations with dental visits. Those patients who want to complete numerous or complex services in fewer appointments may also benefit from dental sedatives. We offer nitrous oxide and oral conscious sedation options to keep any patient completely relaxed. Oral conscious sedation (OCS) is administered via a prescribed sedative pill. Patients take the prescription about an hour before their appointment time, and they are already relaxed once they reach our office for their procedure. This makes oral conscious sedation a great solution for patients who experience phobia so severe it is difficult to leave home for their dental visits. Due to the long lasting effects of oral conscious sedation, patients need to have a friend or family member drive them to and from our office. Oral conscious sedation delivers a moderate level of sedation, so it’s great for patients with anxiety as well as those with sensitive teeth, gums, and gag reflexes. Every patient responds differently to sedatives, but most people are fully recovered from the effects of treatment in 12 to 24 hours. Once you feel back to normal, you may not even remember your dental appointment. Nitrous oxide is often referred to as “laughing gas.” The sedative earned the name due to the euphoric effects it has on patients. 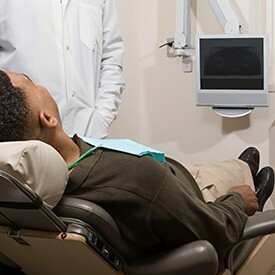 This mild form of sedation is easily administered during dental care. Patients simply inhale through a nasal mask. We can easily adjust the dosage during procedures to ensure patients remain completely comfortable. 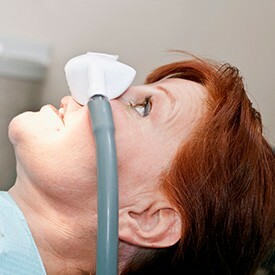 Following treatment, the effects of nitrous oxide wear away quickly. That means patients can drive themselves to and from our office, and they can resume their regular daily activities immediately following treatment. Because nitrous oxide sedation is so fast acting, it’s a great option for patients who need extensive treatment. We can continually administer and adjust dosage to keep patients comfortable throughout the most advanced procedures. Mild nitrous oxide is a great option for kids who will remain safe and relaxed during treatment and go right back to having fun after their treatment is done.